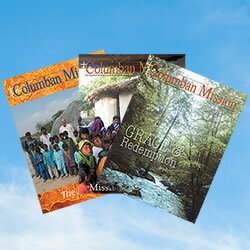 Columban Mission magazine is published eight times a year and tells the stories of our missionaries and the people they are called to serve through our shared Catholic faith. Stories are written by missionaries and include their colorful photographs. Subscriptions are free with a minimum donation of just $10 per year.